to pack up for the day and go home. With one eye on the weather and one on the crucial decisions about weight and balance, the pilot of this de Havilland Beaver has his hands full. The weather, as it does in the mountains, is changing fast and is already moving into the pass in the background. If those silky clouds slipping down over the tops of the peaks meet the fog gathering below, the pass may well become completely obscured. While the adults come to grips with loading the plane, it is now the one last chance for the son to catch that trophy trout he’s seen plying the water beneath the dock. He wants to stay until he snags it. 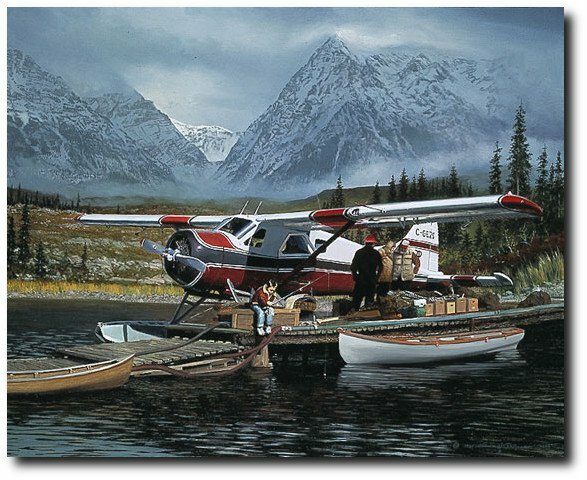 William S. Phillips’ Last Chance celebrates the bush adventure, lifestyle and wilderness access that the de Havilland Beaver so embodies. The little boy fishing to the absolute last minute is symbolic of the youth that lives on in many adults. This Anniversary Edition Giclée Canvas is for those who enjoy the bush pilot tradition of seat of the pants flying and carry fond memories of their own fishing camp adventure up north.